Hi! Happy Monday! How was your weekend? Mine was super low key which was just what I needed. Aaron was out of town this weekend so I had the whole apartment to myself. I obviously love living with Aaron or else I wouldn't have said yes but let's be real, I don't mind having the apartment to myself once in awhile. We share an 890 square foot apartment. It is beautiful and I love it, but it is close quarters and a weekend free to spread out and play couch commando isn't the worst thing in the world. Our apartment doesn't offer much in the way of storage and closet space. Much to my dismay, and perhaps Aaron's, we have to share our one walk in closet. City living at its worst....and serious first world problems. Because of our limited space (and the limitations placed on me by my bank account), I stock my closet with pieces I can wear in multiple ways. In a series of posts, I'll share with you some of my favorite closet staples -- the pieces I wear regularly and all in different ways. First up, in no particular order, is outerwear. 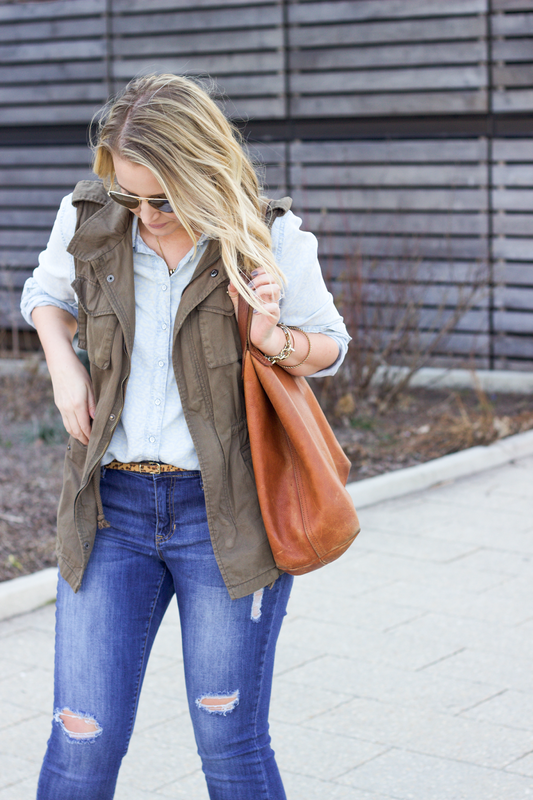 A green cargo vest is easy to wear over jeans for casually running errands or over a dress for brunch. If you're like me and try to follow the rule of three (wearing three pieces to complete an outfit), a vest is a super easy third layering piece. I've been rocking a denim jacket since I was a little girl. Seriously. I've always had one in my closet. If I think what is a quintessential Nicole piece of clothing, the first thing I think of is a jean jacket. It is the perfect functional layering piece. It should be no surprise to you that a leather jacket is on this list for me. In the fall and winter, it replaces my denim jacket as the outerwear piece I reach for the most. I wear it casually over leggings or as seen here to balance out a feminine skirt. A neutral trench coat is a classic and will never go out of style. I picked this trench coat up on a super sale at Banana Republic which was a steal, but happily would have paid full price. I wear this on the weekend as seen here or during the week when commuting to work over work clothes. The key with a trench is to invest in tailoring so it doesn't look too boxy and overpower your frame.